SPIROL produces single Shims custom-made to individual customer specifications from a comprehensive inventory of raw materials in thicknesses from 0.02mm to 9.5mm (.001" up to .375"). 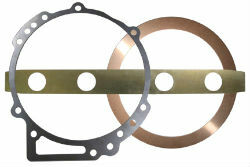 If you are designing a new Shim, take advantage of SPIROL’s complimentary engineering assistance. SPIROL has the technical product know-how and manufacturing expertise to assist your engineers in designing the lowest cost Shim to meet your needs. If you are in need of a supplier for an existing Shim, SPIROL’s estimating team will provide a quick turnaround quote to meet your budgetary and delivery requirements. For a new or existing Shim, just get started with a quote. Most single Shims can also be supplied in Edge Bonded configurations. The most recognized names in the aerospace, agricultural, automotive, industrial, government/defense and heavy equipment industries trust SPIROL to be their Shim supplier.